As of late I've been reading about the Nestorian Christian (Jingjiao 景教) community that thrived in China from the early seventh to mid-ninth century. Their church was, it seems, largely responsible for transmitting Hellenistic astrology and even some Near Eastern occult practices into China, hence my present interest. Their active influence in Chinese religious history during this period is not always recognized, especially in Buddhist Studies. There are several documents from their movement preserved in Chinese, in addition to two steles that were unearthed in Chang'an and Luoyang, thus we know a fair amount about their church. Nestorianism as a Christian movement initially developed in the fifth century starting from Nestorios (c.381–c.451), who was bishop of Constantinople between 428–431. The primary doctrine of Nestorianism is that Christ was comprised of two separate persons, one human and one divine. This was rejected as heretical by their opponents. The Nestorian bishops were condemned at the Council of Ephesus in 431. The result was an eastward spread of the Nestorian movement. It eventually spread all across the Near East and Central Asia before reaching China in the year 635 when a mission led by Aluoben 阿羅夲 (also rendered as 阿羅本) arrived in the capital Chang’an 長安. His name in Chinese might have been a transliteration of 'Abraham'. This mission occurred towards the final years of the Sassanian dynasty (224–650), and was shortly after the first Arab invasions of Iran starting in 633.1 This leads me to wonder if these early Christians in China might have been refugees. By the late eighth century the Nestorian Christian community was thriving in China. We know this from a famous stele that was erected in the year 781, often called the 'Nestorian Stele' 大秦景教流行中國碑. 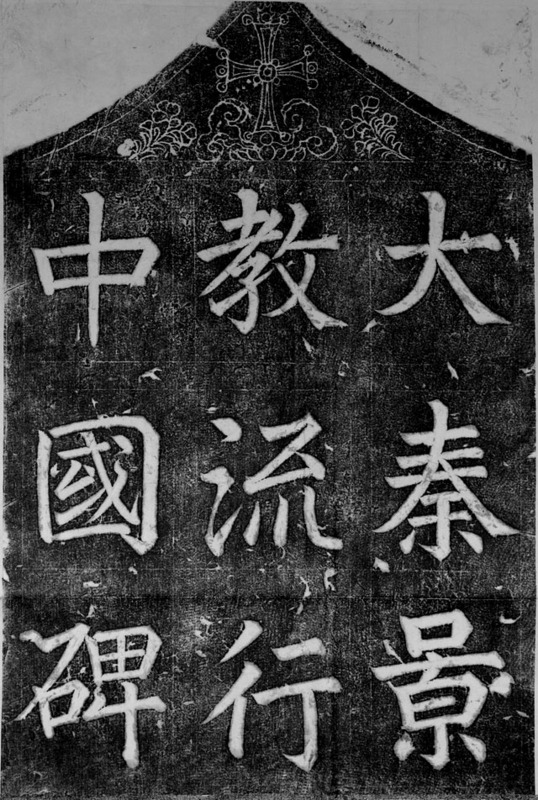 The stele inscription describes the first Christian mission to China, some basic Christian doctrines and the names of clergymen in Chinese with parallel Syriac and Persian names written in Syriac script. It interestingly also provides dates according to the Chinese, Greek and Persian calendars. The text is composed in very elegant literary Chinese and was clearly written with elites in mind judging from its grammar and use of refined vocabulary. The inscription on the stele was composed by a certain cleric named Adam 景淨 from Daqin-si 大秦寺. In one Buddhist source, to which we will return shortly, Adam is also identified as a 'Persian monk' 波斯僧.2 'Daqin-si' referred to a Nestorian Christian church, but in this case refers to the one in Chang'an. Normally, Buddhist monasteries are indicated by the suffix -si 寺 (temple), but throughout the Tang dynasty (618–907), Nestorian churches were also designated with this suffix. There were such churches in both capitals (Chang'an and Luoyang). They were originally called 'Persian temples' 波斯寺 due to the original missionaries in 635 having come from Persia, though in 745 an imperial edict had them renamed to Daqin-si. The following edict records this. The angel [Gabriel] proclaimed good tidings. The Virgin gave birth to the Sage in Daqin. The luminous asterism indicated a portent. The Persians witnessed the brilliance and came to pay tribute. This of course is referring to the birth of Jesus Christ in Bethlehem. In light of this and the otherwise nebulous understanding of Daqin as being “west of the Western sea ​(i.e., the Caspian Sea),” I am convinced that 'Daqin' refers to the general geographic region of the Levant. It seems that Nestorians arriving in China all identified as either from Persia or Daqin, which is instructive since these territories were under the rule of the caliphates. They did not, so far as I know, identify as coming from Arabia. The word for Arabia in Chinese in this period was Dashi 大食, its Middle Chinese pronunciation reconstructed as dâiᶜ dźjək (Schuessler IPA). This is most certainly derived from Middle Persian word tāzīk / tāzīg, 'Arab'.4 One might imagine Nestorian Christians in China identifying their ethnicity as Syrian, Persian or Sogdian, but never Arab even when they had been born under a caliphate. Incidentally, later on 'Daqin' was changed to 'Fulin' 拂菻. In Middle Chinese this is reconstructed as pʰjuət *ljəmᴮ (Schuessler IPA). This appears to be a transliteration of an Iranian pronunciation of 'Rome', such Sogdian frwn and brwn, or Middle Persian hrōm. How do we know that this refers to Byzantium specifically? The New History of the Tang 新唐書, the revised history of the Tang dynasty compiled in 1060, states the following. Fulin in former times was Daqin. It is located on the western sea. One [account] calls it the 'Country on the Western Sea'. It is forty-thousand li from the capital [of Chang'an]. It is west of *Shan. To the north it meets the Turkish Khanate. To the west it approaches the sea, where there is *Alexandria.5 To the southeast it meets Persia. The name Shan 苫 here most likely refers to Damascus. Its Middle-Chinese pronunciation is reconstructed as syem (Baxter-Sagart 2011). This seems to correspond to al-Shām, the Arabic name for Syria. A Chinese writer named Du Huan 杜環 travelled to the Abbasid Caliphate and returned to China in 762. His travelogue, the Jingxing ji 經行記, states that “the country of *Shan is on the western frontier of the Arab [state]” (苫國在大食西界). This change in name from Daqin to Fulin appears to reflect the ongoing loss of territory of the Byzantium empire. The Levant in the ninth century was no longer under the control of Byzantium state. Chinese scholars only possessed an approximate conception of the Near East's political and physical geography, which helps to explain why Alexandria is erroneously placed at its western side. Nevertheless, it is quite clear that Fulin is a transliteration of an Iranian pronunciation of 'Rome'. Nestorians initially identified themselves as having come from Persia. Later they identified as hailing from 'Daqin', a general term for the Levant, likely as a result of the demise of the Sassanian state by the mid-seventh century. Finally, at some point in the ninth century it seems that 'Daqin' was understood to be the former territories of 'Rome' occupied by the Arabs. Returning back to Nestorianism in China, I want to discuss its interaction with Buddhism. There is an account of the aforementioned clergyman Adam translating a Buddhist text with the Buddhist monk Prajñā 般若. This accounts suggests to me that while the state authorities respected both religions, they desired to keep them separate. In light of the elegant Chinese that Adam composed for the stele of 781, we can infer that he was quite learned in the Chinese classics, and therefore likely mingled with aristocrats in the capital. In such circles eminent Buddhist monks and Daoist priests were also active, thus there were many opportunities for elite religious thinkers to interact. Another interesting fact about Nestorianism in China is that their clerics are on record as having practiced medicine in China. As to the type of medicine they practiced, I have reason to believe that it was actually Greek. Returning to the travelogue by Du Huan, he gives the following interesting account. The Daqin are adept in treating eyes and dysentery. Some can foresee illness before symptoms emerge. Some can perform trephinations and remove parasites. The New History of the Tang also mentions such medical practices in Byzantium. There are skilled physicians capable of performing trephinations and removing parasites to heal eye diseases. Cranial surgery of this type was well known in ancient Greek medicine. As Arani and others note, “Cranial trepanation was first recorded by Hippocrates (460–355 BC).”7 This surgery was apparently performed in China as early as the late years of Emperor Gaozong 高宗 (r. 649 – 27 December 683). There is a story recorded in the Old Book of Tang 舊唐書, compiled in 945, and elsewhere that a cranial operation was performed on Gaozong. It is therefore clear that Nestorian clergyman did in fact practice medicine in China during the Tang dynasty, and moreover they most likely brought with them Greek medical techniques. They also introduced other foreign sciences and arts, such as astronomy and astrology. In 1980 in Xi'an the tombstone of a court astronomer was discovered. His name was Li Su 李素 (743–817) and he is identified as a Persian. It seems that he was a Christian clergyman from the community of Persians resident in Guangzhou. Sometime between 766–779 he was summoned to the court to work in the bureau of astronomy. Later his 'courtesy name' 字 of Wen Zhen 文貞 alongside the corresponding name 'Luka' in Syriac appears on the list of Christian clergymen on the stele of 781.11 Although not immediately clear from his biographical information, he likely practiced Hellenistic astronomy in light of his ethnic and religious backgrounds. Earlier 'foreign' court astronomers, such as Gautama Siddhārtha, employed and even translated Indian astronomy. Li Su as a replacement for Gautama Siddhārtha was likely functioning as a 'second opinion' at court in matters related to astronomy and calendrical science, providing a perspective based on foreign methods. Nestorian clergymen clearly played important roles throughout the Tang dynasty. They were eliminated in China as an institution and religion in 845 when Emperor Wuzong 武宗 (840–846), a Daoist zealot, initiated a purge of foreign religions. Buddhism, Manichaeism and Christianity were, at least in the capital region, rapidly dismantled and their assets liquidated. Buddhist sangha members were defrocked, while Manichean priests were put to death.12 Christianity was to a large part eliminated as a major religion in China until several centuries later under the Mongols. 3 This is reported in fasc. 49 of the Tang huiyao 唐會要. 4 There were many ethnically Iranian persons in Tang China, including those identifying themselves as Persians, but also Sogdians and Bukharans. 6《貞元新定釋教目錄》卷17 . CBETA, T55, no. 2157, p. 892, a7-15. 8 Huang Lanlan 黃蘭蘭, “Tangdai Qin Minghe wei jingyi kao” 唐代秦鳴鶴為景醫考, Zhongshan Daxue xuebao 中山大學學報 42, no. 5 (2002): 61–67. 9 Jiu Tang shu 舊唐書 (fasc. 95). 10 See fasc. 703 of the Quan Tang wen 全唐文. 11 Rong Xinjiang 榮新江, “Yi ge shi Tangchao de Bosi Jingjiao jiazu” 一個仕唐朝的波斯景教家族, in Zhonggu Zhongguo yu wailai wenming 中古中國與外來文明 (Beijing: Sanlian Shudian, 2001), 255–257. Why do you think this (刺頭微出血) is not standard bleeding technique that has been used in Chinese medicine since the Han dynasty or earlier? It uses the same words found in standard Chinese medical texts. The surname Qin 秦 is suggestive of a foreigner. The initial negative reaction by Wu Zetian to the proposed surgery also suggests that it wasn't widely recognized as helpful at the time. It was innovative and new. The phrase 出血 is used 31 times in 《素問》 and 18 times in 《靈樞》 . It is used in every acupuncture text after that. It is used 96 times in 《針灸大成》 (Ming dynasty) for example. 刺 is the most common verb used for bleeding therapy. Wouldn't trepanning have more than a little (微) blood? Head wounds bleed a lot. I think acupuncture or bleeding therapy was not common for emperors... they were too suspicious that it could be a murder attempt and did not like the discomfort it might cause. Plus it meant physical contact with someone of much lower rank. I think this is the reason for her reaction. Of course, I could be very wrong. BTW, in volume 7 of Zhen Jiu Da Cheng 楊繼洲《針灸大成》, the author, Yang Jizhou, recounts the same story under 百會 Bai Hui (Du 20) and didn't act like anything special was meant. He seemed to interpret it as bloodletting. Otherwise, he would have needed to explain trepanning as this was not a common practice. But he assumed the reader would understand it as the more usual thing. At least that is my conclusion. Sorry if I am giving you a headache. Lorraine, I see your point! I looked around on CTEXT and it seems that such a surgery was performed long before the Tang. However, a number of scholars for various reasons suggest that this Qin surname and a few other factors possibly indicate a Nestorian clergyman, though this might indeed be premature. The other factor is that Gaozong says his vision is restored, which seems connected to the accounts of Greek medicine in the sources cited above. Well, he may be foreign and Nestorian, but he could have been there for generations and assimilated. And sometimes the results of bleeding can be dramatic. So I personally remain unconvinced. But the rest of your article was quite wonderful! This discussion reminds me of the [probably false] story of Hua Tuo wanting to perform brain surgery on Cao Cao. Hi! I just found your blog and have been bingeing some of the articles for a while and found them great! The record of the Nestorian 景淨 translating Buddhist Sutras with Prajna is very interesting and strange considering Christianity's general disdain (or Stereotyped disdain, I'm not sure) for "pagans". I have a question about another translator, Kumarajiva, who is remembered for his beautiful translations if Buddhist Sutras. However, a lot of people recently have been saying that his translations are in reality inaccurate and full of errors since he could not write Chinese. How true is this? Are his translations really that bad? I always use his translations (So do 99% of East Asia I Guess) since they are much more enticing to read compared than say Xuan Zang's bland take of the sutras. Kumarajiva's translations are fine, if you compare them to the manuscripts that more or less correspond to whatever original version he used.